The German sports car maker takes issue with shoe company's use of the Cayman name. NEW YORK (CNNMoney.com) -- Can you tell the difference between a plastic shoe and a luxury sports car? Porsche, the famed German car company, is entangled in a legal spat with Crocs, the maker of rubber shoes. At issue: The shoe company's use of the name Cayman for a line of footwear. 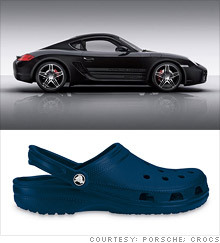 Porsche also has a product called the Cayman, and it claims that Crocs' (CROX) use of the name infringes on Porsche's trademark. In Porsche's case, the Cayman is a two-seat hard-top sports car with a starting price of about $51,000. Crocs' Cayman is the familiar rubber clog with thick soles, holes covering its upper surfaces and a starting price of about $30 a pair. The blog Footnoted.org spotlighted the quirky legal fight this week after finding it disclosed in the fine print of Crocs' most recent quarterly report, which Crocs filed last week. Crocs Europe, a division of the Niwot, Colo.-based shoe company, received a letter from Porsche on May 11 claiming that the Crocs' use of the Cayman name violated Porsche's trademark rights. Porsche demanded that Crocs immediately stop using the name, and also requested payment for the legal costs incurred in writing the cease-and-desist notice. That was followed on July 30 by an injunction against Crocs Europe's use of the Cayman name in Germany. "The company intends to vigorously defend itself against these claims," Crocs said in its quarterly filing. Neither Crocs nor Porsche was immediately available to respond to a request for comment on the legal spat.